Discussion in 'Akbar Creative' started by Akbar, Oct 31, 2018.
so this is for Jamira. I'm not Jamira but looked anyway! HAHAHAHAH! This is an exploit ! (in the swedish tradition of....). actually that seven guys look like 3 different clones ... get to the choppaaah! and don't get trapped into buying it when you can try it for free!!!! First attempt of repair step two. MA is soo bad in modeling! Coat and gloves stick into each other. And what the hell happened to theProphet's upper arm and shoulder? Tbh it's not fun to work with such bad geometry. I assume your avatar is on calypso? I still tend to answer: "Yes, I'am at Calypso." But it's the avatar only ofc. North Space Base A please. Like "Pad two please." from the old C64 game "Space Taxi". I assume they sacrifice details on purpose for the sake of performance. 1. The figures in 3D-applications consist of two main parts. An "active" part and a "passive" one. These are the skeleton wich is animated for movement and poses and conected to this skeleton a skin (body parts or clothes). The quality of the appearence depends to the quality of these connections. The number of faces doesn't matter much. If one puts more effort into building the connections, the quality of appearence increases without decreasing the performance. theProphets upper arm and shoulder arn't good connected to the skeleton. 2. Combining different parts of clothes causes problems when one doesn't care much for how good one part fits to all possible other parts. 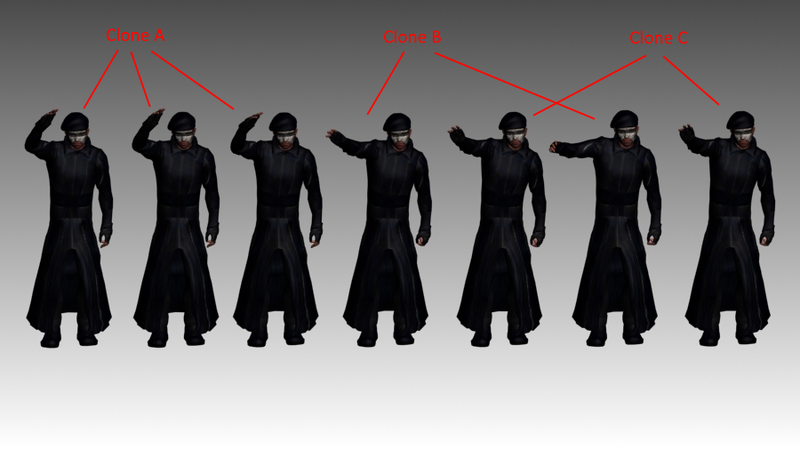 As for instance: theProphet's gloves could consist of two parts each. One of these parts could be switchable on/off. Using a coat with long sleeves tells this switchable parts: off. Using naked arms says: on. Btw. they do this at other parts. As for instance the upper part of theProphet's coat is off when an armor part is used. Such modeling and coding increases the performance because less polygons must be rendered. But it increases the amount of thinking and working at the developers side also. The developers at MA are lazy and negligent. Or even without knowledge. The performance depends, among other things, directly to the number of polygons the render-engine has to deal with. These are very small parts. The amplifier at the side of the rifle is so small that it is nearly invisible. But look at the number of polygons! It's multiple of the rifle itself for each of them. Why? Because they are lazy and work negligent. Or they must be stupid.